Matlab has long been an immensely convenient tool for processing and visualizing signals in a DSP system. The tool makes it very easy to simultaneously visualize a signal in multiple domains. The following is a simple demonstration of some of these signal-processing capabilities. If the initial state of such a filter is such that all internal elements are at zero, the filter described by the following difference equation can produce an impulse response equal to the Fibonacci sequence. The input and output sequences are denoted x[n] and y[n], respectively. For the transfer function H(z), the coefficient matrices of the numerator and denominator polynomials in z-1 are given by B= and A=[1,-1,-1], respectively. The frequency response of the filter can easily be computed using the freqz command in Matlab. In the following snippet of code, H is the complex-valued DFT and W is a vector of radian frequencies at which H has been computed. The following plot shows the magnitude of the frequency response. The frequency response is computed along the unit circle in the Z-domain (z=ejw). Since the response is symmetric, the above plot only shows W/pi going from 0 to 1. As expected, the magnitude response shows peaks near 0 and 1, due to the relative proximity of the poles to these two points. In the time-domain (or sample-domain), the response of such a system to a particular input sequence can easily be computed using the filter command in Matlab. In the following fragment of code, the above filter polynomials are used, along with initial states of zero. The input stimulus sequence x is ten samples of a Kronecker delta function, starting at n=0 and ending at n=9. The filter output y is initially 0, but then proceeds through the next ten numbers in the Fibonacci sequence. A quicker way to compute the impulse response is through the impz command. The following line of code not only gives the first 10 values of the impulse response, it also produces a stem-line plot of the impulse response. A simpler way to implement a Fibonacci sequence generator would be to discard the input x and initialize the filter to [1,0] instead of [0,0]. In any case, the Fibonacci filter example is not really practical, as the numbers increase until the internal states exceed the numerical limitations of the implemented machine. An unbounded response indicates that the filter is unstable, and this is confirmed by the location of a pole outside the unit circle in the Z-domain. Copyright © 2012 Waqas Akram. All Rights Reserved. I have a few friends who work at Google, and they are all top-notch engineers and thinkers, so it’s not a coincidence. Any good organization has a technical screening process that covers more than just the basics, and it looks like Google is no exception. In fact, the above note makes it seem like they go out of their way to ensure the candidate comes prepared to show their best, something that not all companies do. In this case, the important thing to note is that Google is more interested in smart software engineers than simply web developers. Edit: For whatever reason, the linked blog is down. However, the cached version of the blog can be found here (cached by Google… so meta). During a recent interview, the great musician Neil Young expressed his desire for high-quality formats for music downloads. In terms of popular music, high-quality refers to file formats which preserve high-resolution data (e.g. 24-bit) sampled at rates much higher than necessary (e.g. 192 kHz). Whereas recording the original sources at higher sampling rates may provide some benefits with respect to the particular equipment being used, preserving these sample rates for distribution of the final mixed music makes no sense. An excellent discussion of why this format is unnecessary can be found here (xiph.org). Over the years, many “audiophiles” have insisted on creating new file formats, distributing the audio files at absurd sampling rates, for the sake of “remaining faithful to the original audio waveform.” While many people know about the sampling theorem, there is a common misconception present in the minds of the lay-person when they look at the image of a sampled waveform and try to apply their intuition: they see the output of a the sampling process as a disjointed and distorted-looking stair-step response. It has become common practice to represent the sampled waveform through an analog-to-digital converter (ADC) as a stair-step response (including on this blog). This representation is not strictly correct because it presumes that signals produced at the output of an ADC have a continuous-time representation. What actually emerges from an ADC is a signal in the discrete-time domain, where the waveform discontinuous and only exists at the sampling instants. This may seem like a trivial point, but there are ramifications for the untrained eye. When someone who is not well-versed in signal processing theory views an image showing the classic stair-step sampled waveform, their mind intuitively views this as a grossly degraded version of the original waveform. This leads to scores of “audiophiles” to incorrectly assume that an audio signal sampled at 192 kHz is inherently “more accurate” than more traditional (and sufficient) rates of 44.1 kHz (compact disc) or 48 kHz. In reality, the output of an ADC looks more like a discontinuous sequence of points (“dots”) which when interpolated recreate the original signal. When such an image is shown to the human eye, the sampled waveform does not appear as distorted as the stair-step representation. The digital (discrete-time) circuitry that follows the ADC has no concept of what the signal might look like in-between the samples. The signal only exists at the active clock edges, and as long as Nyquist is satisfied the samples accurately represent the input waveform (assuming all setup-time and hold-time constraints also remain satisfied). In order to understand how the stair-step response comes about, we need to consider the operation of a digital-to-analog converter (DAC). When converting a discrete-time signal to a continuous-time waveform, something known as a reconstruction filter is required. This reconstruction filter is specially designed to produce a continuous-time output when provided with a discrete-time input. A common type of DAC reconstruction filter is the zero-order hold, which is implemented by simply holding constant the previous sample until the next sample is encountered. The zero-order hold reconstruction filter is what leads to the aforementioned stair-step representation of the input signal. The sight of this repulsive-looking waveform leads to further questions. What do those “stair-steps” represent? Are they harmful? How do we remove these effects to recreate the original smooth signal? In order to answer these questions, we must dig deeper. The filtering operation is basically a time-domain convolution of the input signal with the filter’s impulse response. This corresponds to a multiplication in the frequency domain. The impulse response of a zero-order hold reconstruction filter is a single square pulse, with a width equal to the sampling period. Its frequency-domain representation looks like a sinc function, which continues forever in both positive and negative frequency directions, with nulls at multiples of the sampling rate. Any discrete-time signal has a frequency-domain representation which contains an infinite number of copies of the input signal band, spaced at multiples of the sampling rate. The time-domain convolution of this signal with the reconstruction filter is equivalent to the multiplication of their frequency-domain representations. As a result, the reconstructed signal still contains an infinite number of copies of the original waveform, albeit attenuated as we move further and further away from the origin in the frequency domain. The presence of these higher-frequency copies is what leads to the stair-step shape of the signal waveform. As long as the repeated copies can be removed without harming the primary signal band, the original signal can be perfectly reproduced without any loss. These copies need to be filtered out in order to leave us with a clean single spectral copy of the original waveform. This is usually achieved using a low-pass filter at the output. Throughout this signal-chain, there are practical issues that need to be dealt with, such as correcting the pass-band droop in both the reconstruction and the low-pass filters, as well as compensating for any phase non-linearities. The point of all this is that what actually emerges at the output of an ADC is a series of instantaneous sample dots, floating in time and space, and ready to be consumed by the next discrete-time (digital) processing circuit. The human brain finds it much easier to spatially interpolate these points and imagine these to be a reasonably accurate representation. However, a stair-step depiction of the waveform is not only rejected by our intuition, but strictly speaking, it is also not what actually emerges from the ADC as digital samples. The stair-step waveform more closely represents an intermediate signal within a DAC that happens to use a zero-order hold reconstruction filter, and this is the wrong waveform to which the lay-person’s intuition should be applied. 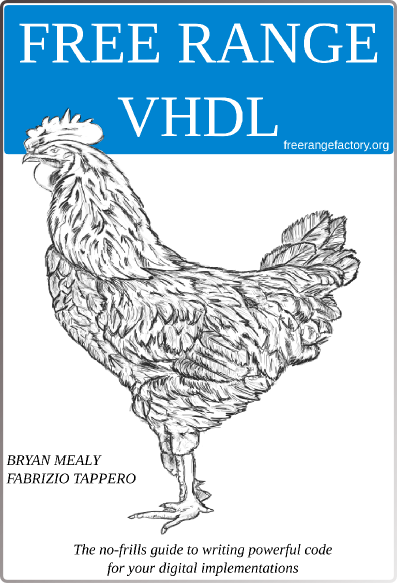 Free Range VHDL, by Brian Mealy and Fabrizio Tappero, is the latest in a long line of books written about VHDL. What makes this a unique offering is its simplicity as an introductory text, and the fact that it is absolutely free. The book is offered under the Creative Commons Attribution-ShareAlike Unported License, and can be downloaded in PDF and LaTeX format from the Free Range Factory website. The book is far from a complete reference on VHDL, missing coverage of several important topics. These omissions are actually the basis for its strength. As anyone trying to learn a new language can attest, there is a fine line between introducing basic concepts and overloading the reader with unneccesary information. If you want to learn VHDL, this book may not be the final word, but can most certainly serve as the first. 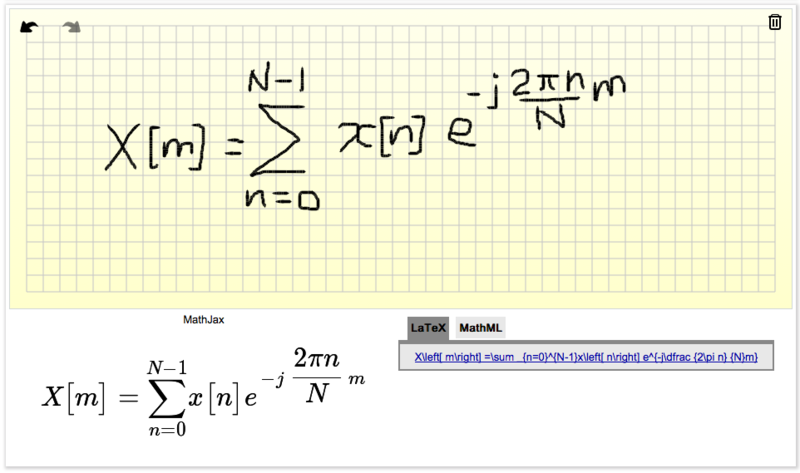 I came across a really neat web demo of a mathematics equation hand-writing recognition tool called Web Equation. It can be used to recognize a hand-written mathematical expression (using your computer mouse or track-pad), and then convert it to the corresponding LaTeX or MathML code fragment. A few moments after the user has ‘drawn’ the formula, the code-fragment appears in a small box and can then be copy-and-pasted into your document editor. With the news today about a proposed overhaul of college financial aid that would create a dependence between aid programs and the affordability of an institution, there is a sense that the trend of migrating more collegiate-level education to the online classroom will continue at an accelerated pace. In order for an educational institution to improve affordability and value for students, they drastically need to either cut costs, improve enrollment using the same resources, or both. Online education has the potential to reach whole new markets around the world, as shown by the recent example of Sebastian Thrun‘s class Introduction to Artificial Intelligence. The Stanford professor allowed anyone to enroll for the class for free and taught the exact same course material and handed out the same homework assignments as the paying students. The response was overwhelming, to the tune of more than 160,000 students world-wide. Some students created an online study group on the aggregation website Reddit. Here is NPR’s story about Thrun’s class on All Things Considered. That this is more affordable to an institution is unquestionable. Once the lectures are recorded, universities need only provide the server capacity to handle student clients from all over the world. Online tests and homework assignments make the job of grading that much easier. Humans need not be involved once everything is in place. The benefits of online education are numerous, but two points stand out above the rest: the lowering of educational costs, and the ease with which quality education will reach parts of the world (and the country) where this was not possible before. One of the greatest causes for concern with a young family is the kids’ college fund. Wages have to keep up not only with inflation, but with already-astronomical and still rising educational costs. Thrun’s experiment in reaching students around the world made him realize the importance of reaching such a wide and socio-economically disadvantaged audience. He has now started an online university called Udacity, offering free online coursework to anyone around the world. Other initiatives have been in place for longer, such as the Khan Academy, MIT’s OpenCourseWare initiative and the OpenCourseWare Consortium. Initiatives like these indicate that the established providers of quality education are about to see a rapid rise in competition for students and their tuition fees. As the competition heats up, there is a push for more conventional universities to shift to a more technology-driven curriculum in order to lower their cost-per-student. It may be easy to dismiss faculty concerns as threats to entrenched interests, but there are some genuine concerns. Once the material has been recorded and uploaded, universities have little incentive to update the material as often, given the relatively higher cost to re-record lectures and keep the material fresh. There would be a disturbance in the environment that fosters bidirectional exchanges of ideas and the organic atmosphere between students and instructors that tends to improve lecture styles year-over-year. The material and focus of the lectures may not be as dynamic and responsive to student needs as the semester progresses. Finally, there would be a threat to the teaching profession as fewer professors are hired, reducing the amount of fundamental research done at the university. Indeed at Stanford University itself, there is a renewed sense of urgency to provide a more diverse portfolio of online coursework such as their Center for Professional Development and the Stanford Engineering Everywhere programs. It remains to be seen whether the online classroom will ultimately prove to be a great boon to education, but it is clear that the upside in the short-term far outweighs the downside. A group of MIT researchers have found a way to speed-up the fast Fourier transform for certain types of input data. The technique is described in an unpublished paper, which can be downloaded at this link. • An O(k log n log(n/k))-time algorithm for general input signals. Both algorithms achieve o(n log n) time, and thus improve over the Fast Fourier Transform, for any k = o(n). Further, they are the first known algorithms that satisfy this property. Also, if one assumes that the Fast Fourier Transform is optimal, the algorithm for the exactly k-sparse case is optimal for any k = nΩ(1). We complement our algorithmic results by showing that any algorithm for computing the sparse Fourier transform of a general signal must use at least Ω(k log(n/k)/ log log n) signal samples, even if it is allowed to perform adaptive sampling. © Waqas Akram, 2008-2012. Unauthorized use and/or duplication of this material without express and written permission from this blog’s author and owner is strictly prohibited. Excerpts and links may be used, provided that full and clear credit is given to Waqas Akram with appropriate and specific direction to the original content.